Sitting here in STATIC listening to speakers at the Eight Days a Week launch. This event included Peter Clarke (UCLAN), Bryan Biggs (Bluecoat Arts Centre), Neil Peterson (Liverpool Culture Company), Beatriz Garcia (Impacts08) and Dany Louise (Cultural Critic). 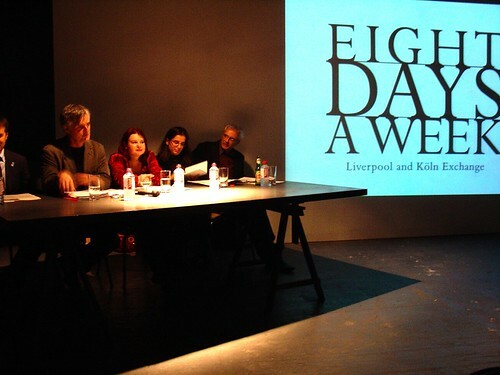 The newspaper is a collaboration between artists in Koln and Liverpool, which are twin cities. It strikes me that a newspaper in an era of pervasive, mobile, digital publishing is a bold statement; quite proper for artists to take on. The interest seems to involve generating a space for artistic collaboration and with Liverpool's trajectory towards 2008, this seems to be an opportune moment to begin new ventures such as this. "we are lucky to have such rich and vibrant cities to be twinned with"
"other priorities include a very exciting project which Sir Bob is leading, called 'Cities on the Edge'...awkward cities...working with Franco Bianchini at De Montfort University...we've brought in other cities...Istanbul, the non-European Capital of Culture in 2008...the sort of things we are going to be developing...football and religion...how football has taken the place of religion in some ways..we may even extend the group to bring in a German dimension." "cultural impacts, social impact, physical impact, and economic impact"
"cultural impacts as distinct from the rest"
"we are trying to ensure in our assessment we consider as much 'who is included'...but also in terms of the 'cultural opportunities'. What new conversations might be happening between artists? How do we link football with the musical background of Liverpool." "Our seevn main aims 1) economic 2) systems 3) cultural dissemination - effect of new initiatives on access...distinguishing this from the broader discussion on social impact...new merging themes that have to do with well-being...how do we access quality of life? how arts and health might be linked. we are having a lot of conversations with the Culture Company. 4) image and perceptions...narratives on the city. one aspect that keeps being important for liverpool as it was for Glasgow in 1990 is the bad associations with the city. 5) also assessing the city marketing strategy, what are the official lines and how people are reacting. ...responses of local communities. 6) infrastructure... uses of public space.transport. 7) the management of the process..,.partnerships...how things are changing over time to react to the environment." "Is this really a golden age?" "To a certain extent, I am being slightly provocative"
"there is still possibly a creativity enjoyed in writing funding applications"
"there is an art to finding the words that give a sense of..the creative"
"the bigger and more developed your artists-led initiative becomes, the more complicated the process...financial independence is the goal"
"a sausage machine for the arts"
"there are more opportunities in the arts now...to explore...a recognised form...but paradoxically, I could argue that the more successful your artist-led initiative is, the less artist-led it may become"
Q: how do artists get involved with 8days? A: there is an ongoing attempt to engage more artists. Younger artists - bring new players to the scene. Bryan Biggs: "there has been hardly any funding to this [8days], so has had the freedom to do what it wants. Energy and good will rather than strategy." [intended as a positive comment]. Peter: "Neil Morrison has been inviting people in to John Moores to do a body of work. He has provided money for materials, the rest has been in kind...what happens in an organic way is that [an exchange of exhibitions takes place]. We had a little bit of money to help with an Easyjet flight, but that's about it. In terms of money its just cost of a few materials..the rest has been suported by the artist looking after the visitor. The biggest funding problem...has been to transport work." Beatriz: "a lot of Glasgow's positive legacy was based not on what the city gave, but what the artists took from the opportunity to be the European Capital of Culture." "this artistic impact has been one of the more important legacies of 1990"
Q: what about the black artists in Glasgow? what voice do they have? Beatriz: Our first project began with looking at young people in Liverpool 8 on how they felt about 2008. Q: Does an artist have to go to school? How does someone get to exhibit their works? Peter: one of the things about the Kolm project is that the demands from artists are incredibly modest. There needs to be a shift in cultural climate. Q: Maybe there should be more support for self-taught artists. Q: does anybody from the 8days collaboration make money? Q: an effort to attract people to the exhibitions to purchase art is needed. Peter: well, we try. this is one of the aims of course. "It's easier to get a show in Liverpool, if you've shown elsewhere." Beatriz: The Arches in Glasgow is an excellent example of combining industries to make art possible. Q: The Garage in Liverpool has a similar concept, but the challenge is raising awareness in the public.